A great many people helped make the KCCUSA project happen. Here is a bit of information about some of them. Jim helped out with construction on Tony, doing much of the torso musculature. Jim works for an environmental software company and lives in the Metro Detroit area. Ken did much of the image processing for, and helped out with construction of, the Froot Loops box. Ken works for Wayne County and lives in the Metro Detroit area. 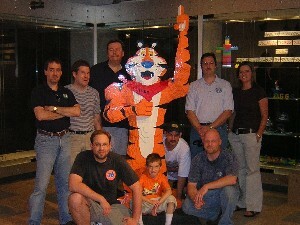 Dave helped with Tony the Tiger, doing the upraised hand, and other details. Dave lives in the Metro Detroit area. Chris was Lead Artist for the Froot Loops box. Chris works in the construction industry and lives in the Metro Detroit area. Larry is the proprietor of Milton Train Works, and thus had overall project management responsibility. He also helped with portions of the display and statues. Larry works for IBM as a Solution Architect and lives in the Metro Grand Rapids area. Nik was responsible for the undersea display. Nik will be in 8th grade next year and lives in the Metro Grand Rapids area. Lead artist for Tony the Tiger, Spencer works at a major auto manufacturer in product development and lives in the Metro Detroit area. Lead artist for Pop!®, Steve also had design and fabrication responsibility for all the bases and armatures. Steve works for an automotive plastics company as a Senior Designer and lives in the Metro Detroit area. Lead artist for Snap!® and Crackle!®. Jason also was the display coordinator and the bulk of the display items are his. As President of MichLUG Jason served as the executive liason to the club. Jason works for Whirlpool as a Layout Drafter and lives in the St Joseph area. Kellogg, Kellogg's, the Kellogg's logo, Tony the Tiger, Rice Krispies, the Rice Krispies logo, Snap! Crackle! Pop!, Froot Loops, the Froot Loops logo, and Toucan Sam are trademarks or registered trademarks of the Kellogg Company, which does not sponsor, authorize or endorse this site. The LEGO company does not sponsor, authorize or endorse the KCCUSA Summer Block Party or these statues or displays. Uncredited images on this or other KCCUSA pages may have been taken by various members of MichLUG. If you have a question about a particular image, or wish credit given, please email me. MTW, Milton Train Works, MiltonTrainWorks.com, and the Milton Train Works logo are trademarks of Milton Train Works and Larry Pieniazek. All other text, images, and trademarks that appear under the www.miltontrainworks.com domain are the property of Larry Pieniazek unless specifically noted. The Milton Train Works web site is hosted by Northstar Computer Systems. Comments? suggestions? Flamage? Mail me! Raytraced background scenery courtesy of Bram Lambrecht. This website features a Blank Page in accordance with to the recommendations of the TPILB-Project.